The Mastiff has a distinctive head with dewlap and flews. The colours of the Mastiff coat are differently described by various kennel clubs, but are essentially fawn or apricot, or those colours as a base for black brindle. A black mask should occur in all cases. The fawn is generally a light "silver" shade, but may range up to a golden yellow. The apricot may be a slightly reddish hue up to a deep, rich red. The brindle markings should ideally be heavy, even and clear stripes, but may actually be light, uneven, patchy, faint or muddled. Pied Mastiffs occur rarely. Other non-standard colours include black, blue brindle, and chocolate mask. Some Mastiffs have a heavy shading caused by dark hairs throughout the coat or primarily on the back and shoulders. Brindle is dominant over solid colour. Apricot is dominant over fawn, though that dominance may be incomplete. 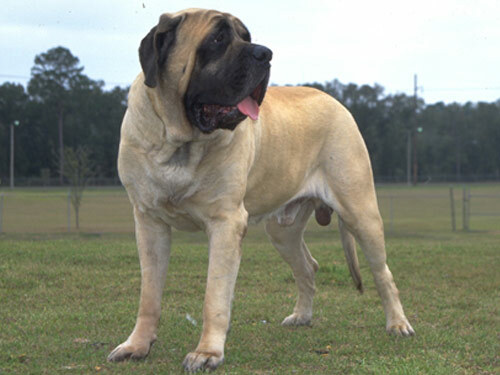 Most of the colour faults are recessive, though black is so rare in the Mastiff that it cannot be certain if it is recessive, or a mutation that is dominant. The greatest weight ever recorded for a dog, 343 pounds (156 kg), was that of an English Mastiff from England named Aicama Zorba of La Susa, although claims of larger dogs exist According to the 1989 edition of the Guinness Book of Records, in March 1989, when he was 7 years old, Zorba stood 35 inches (89 cm) at the shoulder and was 8.25 feet (251 cm) from the tip of his nose to the tip of his tail, about the size of a small donkey.After 2000, the Guinness Book of World Records stopped accepting largest or heaviest pet records. This record has never been officially bested, therefore it is widely agreed that Zorba may have been the heaviest dog ever. The American Kennel Club sums up the Mastiff breed as "a combination of grandeur and good nature as well as courage and docility." Domesticated Mastiffs are powerful yet gentle and loyal dogs, but due to their physical size and need for space, are best suited for country or suburban life. The Mastiff breed has a desired temperament, which is reflected in all formal standards and historical descriptions.